If you try to fish using a trout's shadow, you are setting yourself up for failure by being deceived. This is especially true when fishing deep waters or far from the shoreline. Your best option for accuracy is to use the sun to determine locations. As we know, shadows are cast at a number of different angles. Therefore, when you see a shadow that you perceive to be a trout, before you do anything, look at the position of the sun. In your mind, create an imaginary line that starts at the shadow and goes directly to the sun. 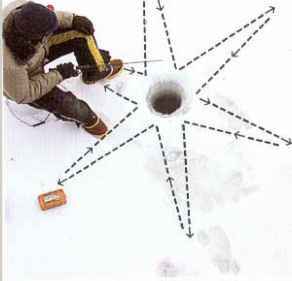 The portion of where that imaginary line falls on the water's surface is the location where the trout will be located. In other words, you cannot detect to an exact position but you can use that line to determine an area where the trout would be located.